Our international brand KnitPro recently participated in a project to create the world's largest crochet blanket. In conjunction with an Indian group called Mother INDIA's Crochet Queens - MICQ, crocheters throughout India and several other parts of the globe took up the challenge. 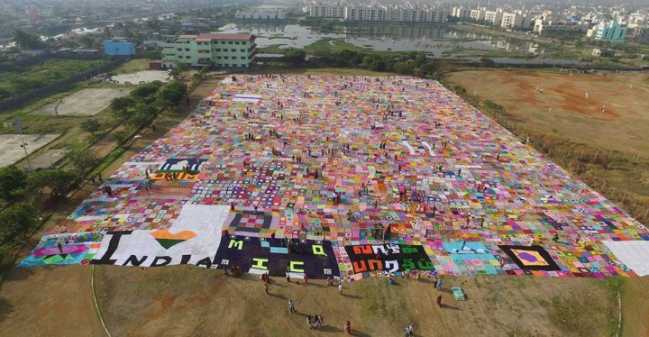 On the 31st of January in Chennai, India, they not only broke the previous record (which was 3,377 square meters), but also set up a nearly unbeatable new world record of the largest blanket with an impressive 11,148 square meters total! We were very happy to be a part of such a major collaborative effort by Indian women! Below, you can see photos of our own team of crocheters who contributed blankets to the project. They were especially excited to participate once they learned that the blankets would be donated to underprivileged children so that they could keep warm during the winter months. Our workers come from humble backgrounds, but the spirit in them to contribute towards a charity cause was very inspiring. Each individual worked day in and day out to finish as many blankets as they could, and their toil resulted in our donating over 500 ready blankets for the record. 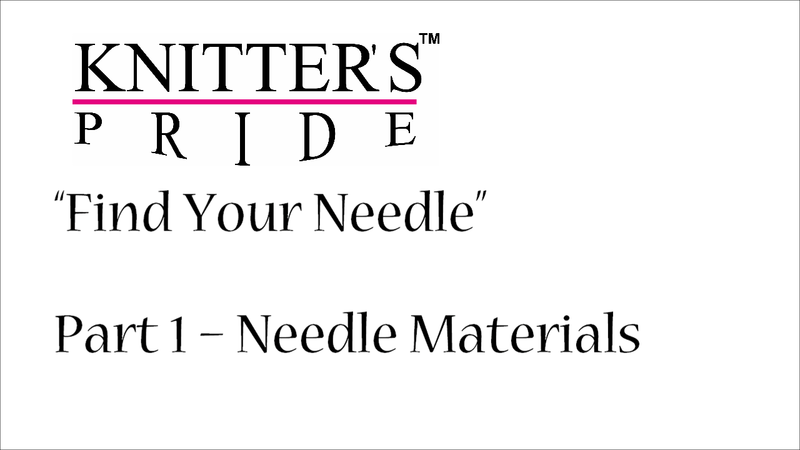 In addition to the number of blankets contributed to the project, we also supplied 300 crochet hooks for this project. We hope you enjoyed this behind-the-scenes peek; to learn more about this project, click here to download a free ebook! Congratulations to dianedora and Angele, who have both won Marblz DPNs! We will get in touch with each of you via Ravelry to arrange for the delivery of your prize. Thanks to everyone who entered this month's giveaway! The designer models her Hiro cardigan. 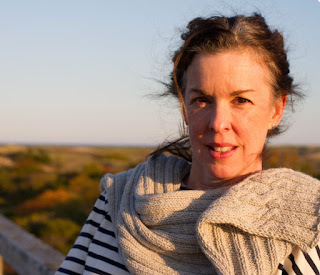 This month, we interview American designer Julia Farwell-Clay, whose work you have probably already seen on the pages of Knitscene, Pom Pom Quarterly, Knitty.com and Twist Collective, among others. Julia is well known for her creative patterns which use cables, color, and other interesting techniques to create striking garments and accessories. You can find her on Facebook, Instagram, Ravelry and Twitter; you can also visit her blog and website. Enjoy! My mom taught me to knit, but I caught the bug when I saw my Danish babysitter knitting at full tilt in such an elegant way I knew I had to re-learn. Annie gave me fun and simple projects to get me going, but I was ambitious. I was so taken with a fisherman’s rib that she showed me that I knit a scarf that used all of the yarn in the house, and probably was 20 feet long. I even wore it wound round my neck as I was still knitting it, which I did for a few months in eighth grade. Some of the kids in school used to love to step on it as I walked to class. I guess that’s what you call an easy target. I “became” a designer by recognizing that the difference between what I was doing for myself and people who were publishing was that they were writing their work down, and of course, doing the math for all the sizes rather than just my one. 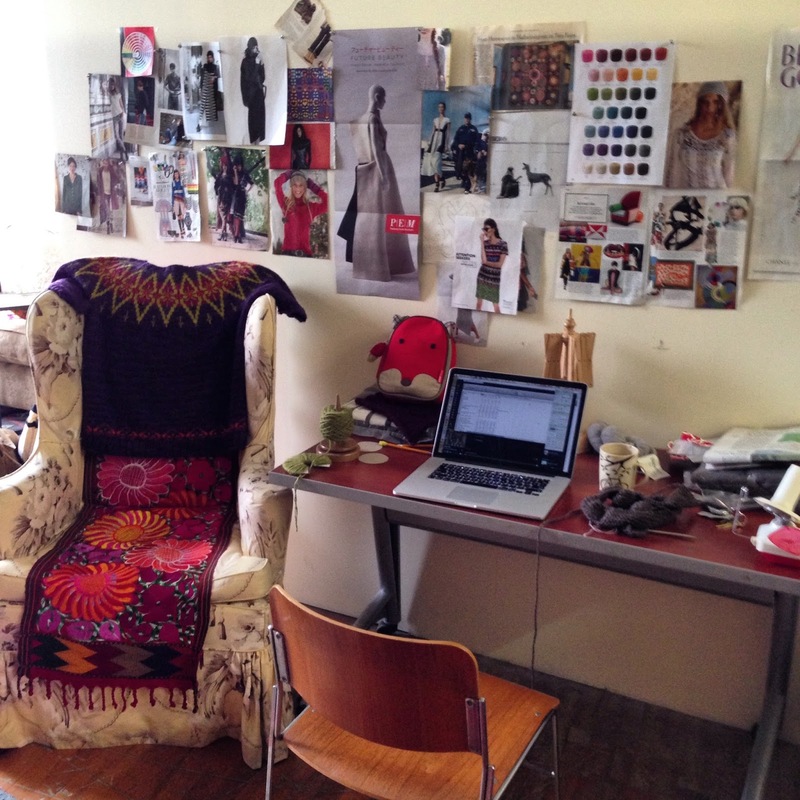 I paid a friend who was a technical editor to show me Excel, I read everything I could about grading patterns, and drew upon what I knew from years of sewing and knitting my own clothes and modifying patterns, which were never right as they came. 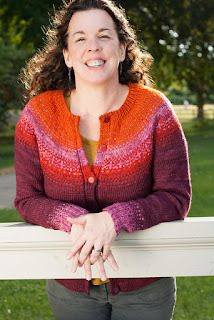 I submitted my first design to Amy Singer at knitty, and I haven’t looked back. What are your favorite patterns that you've designed? I have a particular fondness for a few things I’ve done that were solutions to design problems. When I saw a horizontal cable across the shoulders that was a popular idea a few years ago, all I could do was worry about the binding properties of that cable sitting on top of the body’s biggest range of motion, so I tried to figure out a way to make that cable flexible but retain the design element, and I got Skipperdee. That’s maybe my favorite. But I also like Albers, which looks very complicated and full of ends to weave in, but in fact only has two ends because I figured out a yarn management strategy that is part of the design. And it’s super flattering too. Do you have any knitting horror stories? 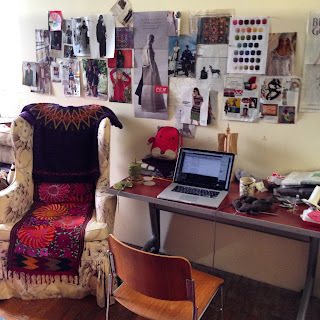 When I was 24, I knit something from Kaffe Fassett’s first book that should never see the light of day, but you can google it: it’s buried here on the blog. What are your best tips for sweater knitting? Oh, I have lots. But I’ll try to keep it to a few things. I think there’s the potential for a lot of fear and frustration in knitting. I knit a lot of sweaters, years of sweaters, with mixed results before I learned how to get to that magical nexus of gauge and fit and flattery. Nowadays, there are all kinds of ways to game the outcome: you have designers who specialize in a high success rate with your very first sweater, and you have Ravelry where you can look at a sweater on the people who have knit it, and hope someone looks enough like you in their shape to help you imagine if it will work in your wardrobe and on your body. I suggest that an aspiring sweater knitter pay for a reliable pattern (free patterns from anywhere but knitty are suspect) that they really love, invest in decent yarn that will put up with a rip out or two, and work on the sweater a little at a time. The first time I finished a sweater on US size 4 needles was a revelation to me. I realized that all that knitting had happened in small bits here and there. I knit when I could, and that was enough over a few months to get me through even all those tiny stitches. And one last thing: never forget that knitting is entertainment. If you’re not having fun, you’re doing it wrong. I think I approach some design work as a research project. Instead of writing and conferencing the paper, I knit the garment as my thesis. My collection for Classic Elite was a study of the Folly Cove Designers; my recurring Cowichan sweater pre-occupation comes from my childhood surrounded by the work of Indigenous Artists in the Pacific Northwest. I don’t just look at pretty things on the internet, I read about them, I visit museum collections when I can, and as I knit them I might be consuming movies or fiction related to the project. It’s a real immersion in a way I recognize from the way I used to produce when I was in the research and publish cycle in academia. Julia Farwell-Clay has always loved making things to wear. Once a college English teacher, Julia left academia to focus on her youngest child, but also found enough flexible time to write the Moth Heaven blog, publish articles and patterns for most of the major knitting magazines, and helped get Twist Collective up and running. As a designer, she is particularly inspired by the bright colors and graphics found in many textile traditions, and also finds inspiration in elements of painting, architecture, and even poetry. In 2015, Julia published From Folly Cove with Classic Elite Yarns, a pattern collection inspired by the Folly Cove Designers, a group of largely women artists who block printed textiles in the last mid-century on Cape Ann, Massachusetts. Her most well known patterns are a popular baby cardigan, Welcome to the Flock, and the Hiro sweater, a perennial favorite at Rhinebeck. This month, we're giving TWO lucky blog readers the chance to win some Marblz DPNs*! To be entered, please leave a comment on this blog post telling us your favorite pattern designed by Julia (click here to see them all on Ravelry!). Be sure to also include your Ravelry ID or email address so that we can get in touch with you if you win. We'll announce our winners on our next blog post on Friday, February 26. Good luck! *Please note, prize may vary from what is pictured here.